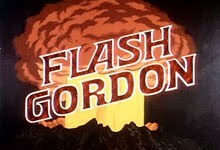 Since I started this blog back in November of 2009, I've received a number of e-mails and comments here and on the Facebook page that contain some misinformation about the 70s sci-fi movies and television shows we all love so much. In many cases, these are clearly just made-up rumors, probably originating in schoolyards thirty years ago. In others, they are perpetuations of errors originally published in fanzines or on websites. In most cases, these "myths" can be disproven with minimum effort. And as long as that's the case, I'll be happy to disprove them! Here are a few that have actually come up more than once. MYTH: The Ark vehicle from Filmation's Ark II television series was the repainted and modified Landmaster from the feature film Damnation Alley. FACTS: I've encountered this myth in the comments section here, a couple of message boards, and at least one fansite. Here are the facts: Filmation's Ark II aired in the Fall of 1976 and was shot that Summer at various locations, including the Fox Ranch. The Ark vehicle was manufactured by the Brubaker Group and built on the chassis of a dump truck. The body was made up of fiberglass sections over a welded steel frame. Some of these sections - including the "nose," were recycled by Filmation to build the full-scale Seeker spaceship for their subsequent show, Space Academy. The vehicle was an empty shell, but did have a functioning ramp in the rear for the small, "Roamer" automobile - which was a modified "Brubaker Box" kit car, built on a Volkswagen bus chassis. Damnation Alley was released to theaters in October, 1977, a full year after Ark II's debut. The Landmaster was built - at a reported $300,000-$350,000 - by famous custom cars man Dean Jeffries' company, which also built the vehicles for Death Race 2000 and the Logan's Run television series. The Landmaster, with its distinctive, "tri-star" 12-wheel configuration, was a functional (and road-legal) "truck." 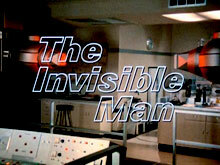 Although it did not appear on Ark II (which would have required time travel), it did appear in various other TV shows and movies, including Get A Life, Hybrid, and A.P.E.X. And if none of that convinces you... a quick look at the two vehicles side-by-side above will clearly show that aside from being big, they don't look very similar at all. 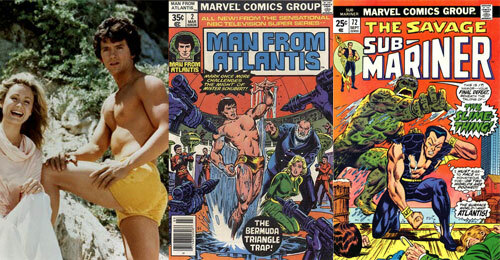 Universal didn't want to pay Marvel Comics for the rights to use "Prince Namor, The Sub-Mariner," so they made up their own undersea hero, as it was easier to have Patrick Duffy portray one water-breathing Atlantean instead of creating costumes, sets, special effects, to show an entire race of blue-skinned water-breathers. When Marvel heard of this, their legal department threatened to sue Universal, but that plan was nixed as Marvel and Universal already had joint ventures with the Spider-Man and Incredible Hulk television series, as well as failed pilots for Captain America and Doctor Strange. So, a deal was hammered out where Marvel would produced the comic based on the situations and characters in the series. But the story doesn't hold water (!) 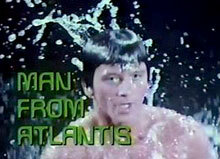 for one major reason - Man from Atlantis wasn't produced by Universal. 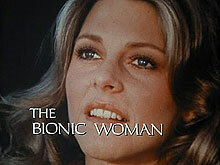 It was independently produced by the Solow Production Company for NBC. 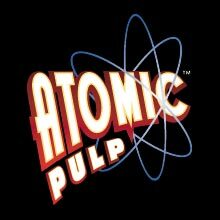 My guess is that Marvel licensed the property for comics for the same reasons that they licensed Star Wars, Logan's Run, Godzilla and the Shogun Warriors - it seemed like something kids would like! 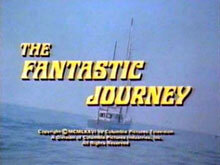 MYTH: Much like the Ark II/Damnation Alley item above, another frequently stated fan "myth" also involves alleged recycling of an important prop - in this case, the frequently-made allegation that the Canadian sci-fi series The Starlost used special effects genius Doug Trumbull's Valley Forge miniature from Silent Running as the basis for the Earthship Ark model. FACTS: It's very easy to understand why people would believe this. 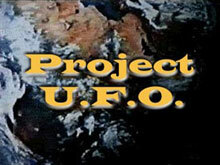 Doug Trumbull (2001, CE3K) was initially supposed to supervise the effects work for The Starlost and was credited as a producer for the entire run of the series. 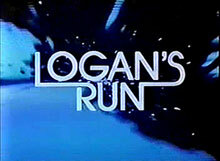 He also appeared in a promotional film for the show with star Kier Dullea, and that promo film did use stock shots from Silent Running to show potential programmers what The Starlost's effects were going to look like. Plus, both the Valley Forge and the Earthship Ark feature large, geodesic domes prominently in their designs. But... Trumbull was already off the show by the time production began in Canada, and while he may have been involved in the initial design of the Earthship Ark, as far as I can determine, he was not present when it was built and did not supervise its photography. 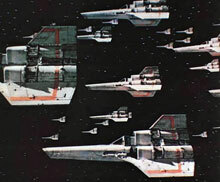 The shapes of the two ships are significantly different, and the Starlost vessel has many, many interconnected domes while the Silent Running ship only had six (although several identical ships were seen in the film, only one model was actually built). The Valley Forge model was about 26 feet long, while the Ark was roughly half that length. Photos found online also show the detailing of the domes from Silent Running (left) and The Starlost (right), and the Ark model seems significantly less detailed (and smaller in scale) than the Valley Forge. Now, that's just from observation. I cannot definitively state that there was absolutely no reuse of parts, but it sure seems unlikely. Undoubtedly the Valley Forge design influenced that of the Earthship Ark, but they were completely different models. 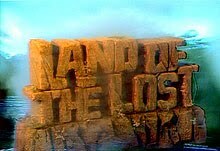 Stock footage of the Silent Running model did show up on episodes of Battlestar Galactica as the fleet's "Agro-ship," but by that point, the original effects miniature no longer existed. Whew. That required more detective work (and Googling) than I anticipated. Of course, it is possible that I may be in error myself with some of my deductions, and I'll happily correct any mistakes, if I receive credible information otherwise. Still, I think I'm right. Anyway, I may do more essays like this in the future. If you have suggestions, post them in the comments section. Great... behind the scenes stuff, especially about props and models, is really interesting to me. There's something fascinating about knowing these vehicles and such existed (or may still exist) unlike a lot of things we see in films today. In a slightly related vein, I don't like when a reviewer back in the day slammed a program or film, in some cases without having paid much attention (criticizing things that would have been explained if he or she had actually watched it), and then for years afterward, other reviewers would simply 'parrot' that negative review. 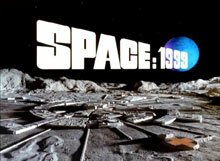 Space: 1999 was a victim of that for many years, and likely still is. I love this debunking! It makes for some very interesting articles and discussion. Keep up the great work! Brilliant debunking, many a '70s playground debate was based upon the facts that you have presented here. Although the Starlost didn't use the Valley Forge, Battlestar Galactica the original series, and Galactica 1980, and the Reimagining did! In the Reimagined BSG, they actually created a CGA model of the Valley Forge. SPACE ACADEMY: "My Favorite Marcia"